To Brandy Borne and her ditzy diva mother, homicide in small-town Serenity is the gift that keeps on taking. But murder turns merry as Brandy and Vivian gather collectible clues in a wintry workshop, seek the grinch who dimmed a pageant star’s twinkle, and bag the humbug helper who snuffed a sidewalk Santa. 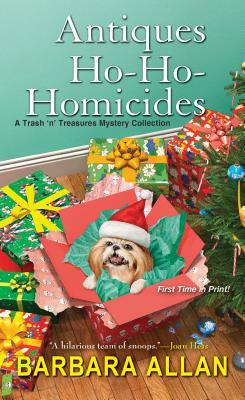 Aided by Sushi, their elfin shih tzu, our seasonal sleuths crumble a bountiful batch of Christmas crookies. And though suspects may show bad will, and good cheer seems in short supply, this collection of Trash ‘n’ Treasures holiday homicides sparkles as the Borne girls wrap up three frolicsome felonies. Includes Brandy Borne’s antiques tips and yummy recipes!